The Australian international earns back-to-back Player of the Month. The Sky Blue FC forward was voted as the best player for the month of June by the NWSL Media Association. For the second consecutive time this NWSL season, Sam Kerr, the Australian international forward for Sky Blue FC has been voted as the NWSL Player of the Month by the NWSL Media Association. Kerr received the honor for May, repeating as the best player in the NWSL for the month of June. The 23-year-old is only the second player in the league's five-year history to earn such honor. Kim Little, the former Seattle Reign FC midfielder, was named Player of the Month in 2014 for both April and May that season. Kerr had an impressive June, scoring three goals, providing an assist, creating eight scoring opportunities, and taking eight shots on goal. Her performance against the Portland Thorns on June 17 earned her Player of the Week honors for Week 9. She scored two goals and one assist against the top-rated Thorns defense. Kerr also assisted Raquel Rodriguez on the goal that put Sky Blue FC in the lead immediately after kickoff, exactly 24.76 seconds into the game, officially becoming the fastest goal in NWSL history. The Sky Blue forward celebrated with a backflip after her second goal soared past Thorns goalkeeper Adrianna Franch that gave Sky Blue a 3-1 victory at Providence Park. Two weeks later, Kerr again set social media ablaze with replays and GIFs of her goal-scoring bicycle kick at the start of the second half against the Orlando Pride. The memorable goal put Sky Blue ahead 2-1. Kerr has played all 11 games for Sky Blue this season, starting in 10. She has scored five goals with 22 shots on goals and assisted on three Sky Blue FC goals. With her five goals, Kerr stands at third among the NWSL scoring leaders behind Orlando Pride’s Marta (six goals) and Seattle’s Megan Rapinoe (seven goals). 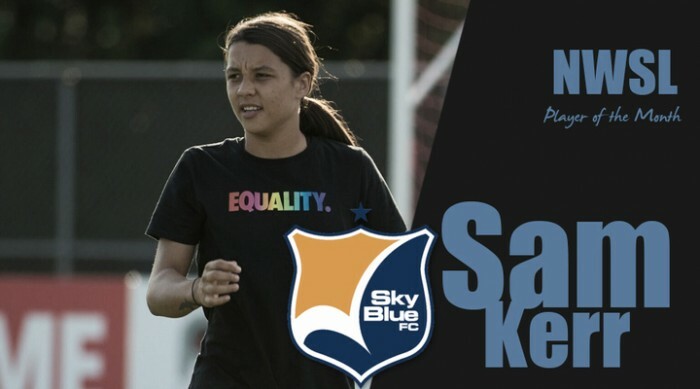 Sam Kerr and Sky Blue FC travel to Cary, North Carolina this Saturday to take on the number one team in the NWSL, the North Carolina Courage. 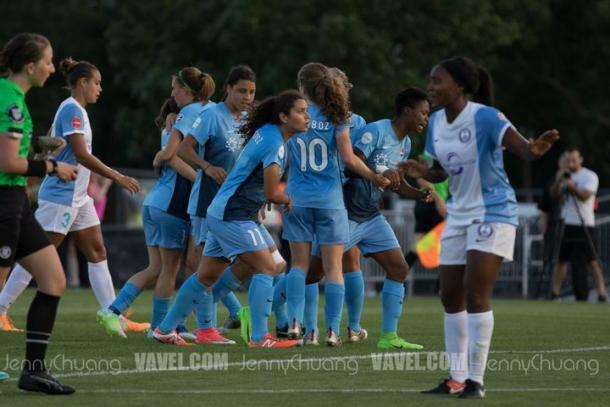 Sky Blue FC currently sits at number five in the NWSL standings, one point behind fourth-place Seattle and two points behind third-place Portland.